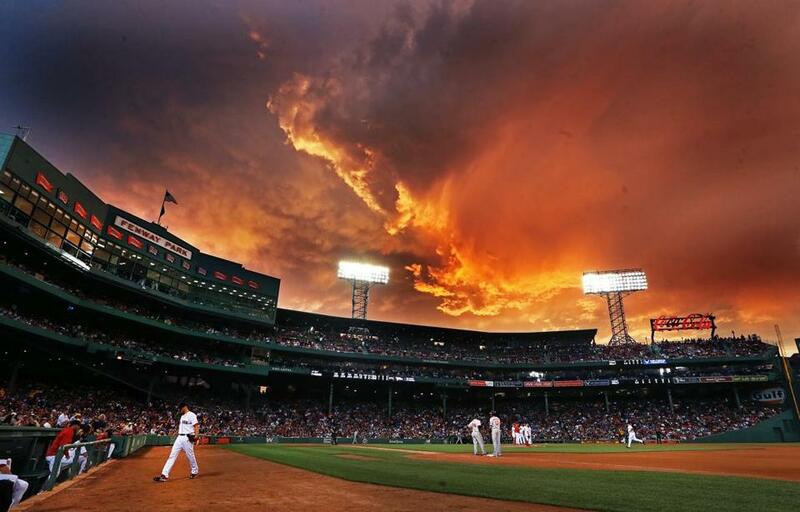 Storm clouds provided a colorful backdrop over Fenway Park as the Red Sox played the Orioles. High winds and rain barreled across the Commonwealth on Tuesday, cutting power to thousands of residents, felling trees and power lines, and prompting tornado warnings that were in effect for much of the day. Tornado warnings that had been issued throughout the state were canceled Tuesday evening as calm returned to most of Massachusetts after strong thunderstorms had rolled from west to east before heading out to sea. As of 6:39 Tuesday night, the last warning was canceled and forecasters said there was no confirmation of a tornado touchdown anywhere. Also, a tornado watch was lifted by 10 p.m. for all counties in Massachusetts except for “Barnstable, Dukes and Nantucket,” the Massachusetts Emergency Management Agency said in a statement. All watches had been lifted shortly after 11 p.m.
“Some thunderstorms linger on the Cape and Islands, but the systems that posed the most significant threats have now passed through the Commonwealth,” MEMA said. Read: How often does Mass. see tornadoes? A tornado watch means conditions are favorable for severe thunderstorms and tornadoes in and close to the watch area. Officials say that if a tornado watch becomes a tornado warning, people should get inside, away from windows, and into the lowest location in the building. Earlier in the day, the watch covered all of Massachusetts except for Berkshire County. The area also extended into Maine, New Hampshire, Rhode Island, and Connecticut. Officials said no injuries and no major damage had been reported as of late Tuesday night. Communities reporting downed trees, utility poles, and wires included Franklin, Blackstone, Wrentham, Mansfield, Easton, Colrain, Phillipston, Falmouth, and Hyannis, the National Weather Service in Taunton said. Hail was also reported in Wrentham. In a late-night advisory, MEMA said that while no tornadoes hit the state, several sightings of wall and funnel clouds were reported in Marshfield, Wrentham, and Taunton earlier in the evening. State Police reported at about 7:30 p.m. that Route 20 east and westbound in Russell was closed to traffic because of a downed tree. The highway reopened in both directions about an hour later. 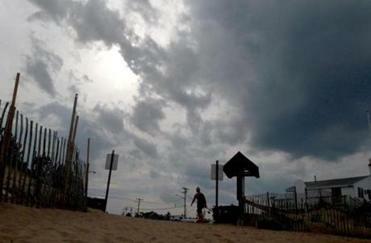 Earlier in the day, thunderstorms swept through the state. Wind gusts reached 69 miles per hour at about 12:25 p.m. on Plum Island, said Alan Dunham, a meteorologist with the National Weather Service. The gusts approached hurricane force, which is 74 m.p.h., and brought down several wires in the area, Dunham said. Jim Hilton, head golf professional at the Ould Newbury Golf Club, was driving to Newburyport just as the storm hit. Luckily, he said, the golf course was not hit too bad. The weather service issued a tornado warning for Essex County around noon, but canceled it shortly afterward. State emergency management officials reported shortly before 9 p.m. that 6,987 customers were without power throughout the state. That number had risen to 9,359 as of 11:15 p.m., MEMA said. Temperatures Tuesday reached the mid-80s at Logan International Airport. They were expected to fall to the low 60s at night. At about 11:15 p.m., the weather service reported temperatures at 70 degrees in Springfield, and winds reaching 17 m.p.h. In Boston, temperatures hovered at 76 degrees at 11:15 p.m. with 9 m.p.h. winds, while parts of the Cape dipped to the 60s and low 70s with winds of up to 20 m.p.h., the weather service reported. Forecasters say the rest of the week will be relatively calm and sunny. Wednesday and Thursday will see highs in the upper 70s and lows in the upper 50s, forecasters said. Friday will be slightly cooler, though still sunny, with highs in the low 70s and lows in the mid-50s. After temperatures crest in the low 70s Saturday, they will fall to the mid-50s at night. Another chance of rain will move into the region Saturday night into Sunday, but no severe weather is expected, Dunham said. Late Tuesday night, the weather service said it would conduct a storm survey on Wednesday morning along the Massachusetts-Rhode Island border. The weather service plans to release a final assessment of the storm damage later in the day on Wednesday. Travis Andersen of the Globe Staff contributed to this report. Aneri Pattani can be reached at aneri.pattani@globe.com. Follow her on Twitter @apattani95. Martin Finucane can be reached at martin.finucane@globe.com.